Autistic Hoya: Court Hearing on JRC - October 26! Court Hearing on JRC - October 26! Content/TW: Fairly descriptive discussion of torture and abuse of people with disabilities using electric shock in an institution. There is a court hearing about the Judge Rotenberg Center (JRC) scheduled to begin on Monday, October 26 in the Bristol County Probate & Family Court in Taunton, Massachusetts. Arguments are expected to continue for around a month. If you are able to attend part or all of the hearing, which is open to the public, please do so! We need advocates in the courtroom! 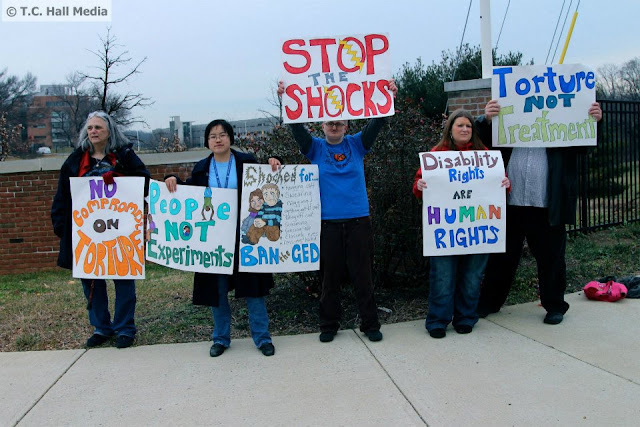 Photo: Disability and youth rights advocates protesting aversive electric shock "treatment" outside the U.S. Food and Drug Administration (FDA) in Silver Spring, Maryland in January 2013. Hand-drawn signs have slogans "No compromise on torture," "people not experiments," "Ban the GED" with a list of minor infractions shocks are used to punish, "stop the shocks," "disability rights are human rights," and "torture not treatment." From left to right: Diane Engster, Lydia Brown, Shain M. Neumeier, Kathleen N. O'Neal, and Patrick T. Ayers. Photo by Taylor C. Hall, T.C. Hall Media. The Judge Rotenberg Center was originally founded as the Behavior Research Institute. It didn't start shocking people (as it is now infamous for doing) until 1988, but since its beginning in 1971, founder Matthew Israel instituted a regime of pain to coerce behavioral modification for the children, youth, and adults with intellectual, developmental, and psych disabilities committed to his "care." Food deprivation. Prolonged restraint. Seclusion -- which is ultimately a form of solitary confinement in the name of "treatment." Forced inhalation of ammonia. Sensory assault with the notorious white noise-blasting helmet. Slaps. Pinches designed to maximize pain by digging nails into muscle. Since 1971, six people receiving "treatment" at BRI/JRC have died in their care -- Robert Cooper (d. 1980), Danny Aswad (d. 1981), Vincent Milletich (d. 1985), Silverio Gonzalez (d. 1998), Linda Cornelison (d. 1990), and Abigail Gibson (d. 1997). Brandon Sanchez was the first resident to be subjected to electric shock. The device was called the SIBIS -- self-injurious behavior inhibiting system. Although staff at BRI/JRC have long known that darkened, cool, low-stimulation environments help Brandon Sanchez self-regulate and decompress, they began to treat his extreme self-harm by shocking him under the belief that association of unwanted behavior with painful stimuli would decrease the unwanted behavior. (In other words, it's like applying dog training tactics to humans, or at least humans deemed sub-human.) On one day, he received over 5,000 shocks from the SIBIS in a single day. After that, Matthew Israel asked the SIBIS manufacturer to build a stronger device. They refused. Matthew Israel invented his own device, the graduated electronic decelerator (GED), which emitted a stronger current and shock than the SIBIS. The GED works by strapping electrodes on a person's arms, torso, and legs, which are activated when someone presses a button on a remote control. Over the past couple decades, the GED has gone through several iterations, each more powerful and painful than before. The present model in use, the GED-4, is designed to be more powerful and painful than a police taser. Theoretically, the "therapy" is used to reduce or eliminate dangerous or aggressive behavior -- like someone picking at their eyes and causing a vision disability, or someone banging their head against a wall and causing a brain injury, or someone physically attacking other people. In reality, the aversive electric shocks are given for behavior ranging from closing eyes while walking in the hallway to trying to hold a staff person's hand, or from getting out of seat without permission to using swear words, or simply for non-compliance. In April 2012, a medical malpractice lawsuit brought by the family of Andre McCollins went to trial before a jury, where video footage of the shocks was played in public for the first time (photosensitive epilepsy warning -- video flickers / also graphic footage of torture at this link). Ten years before, in 2002, Andre McCollins, a black autistic teenager with other cognitive and psych disabilities, had been shocked 31 times in 7 hours while restrained face-down in four-point restraints. The long shock session stemmed from a brief verbal interaction with a staff person who told him to take off his jacket, and he dared to say, "No." The shocks are as much for "non-compliance" as they are for anything else. Since 1971, dedicated advocates including titans like Nancy Weiss, Fredda Brown, and Polyxane S. Cobb have fought to close the JRC and end their abusive practices. Survivors like Jennifer Msumba and Ian Cook testified in front of the U.S. Food and Drug Administration. Disability rights organizations across the country have repeatedly condemned the JRC, along with the current and immediately former U.N. Special Rapporteurs on Torture. But legislation has never made it through the Massachusetts State House. Congress has never passed any measure that would ban aversives and dangerous restraints and seclusion. The U.S. Department of Justice civil rights investigation has produced no fruitful results. The FDA has never issued a decision after hosting a public hearing about the possibility of banning electric shock aversives. And Massachusetts' regulatory agencies (Department of Developmental Services -- formerly Department of Mental Retardation, Office of Children and Families, etc.) have been almost totally unable to do anything about the JRC because of the Massachusetts courts. Jennifer Msumba, a black autistic woman who survived seven years at the JRC, blogs about her experiences. Video of my testimony before the Massachusetts legislature about bill that would ban electric shock aversives. Opinion piece I wrote in the Washington Post about the JRC's shock "treatment." 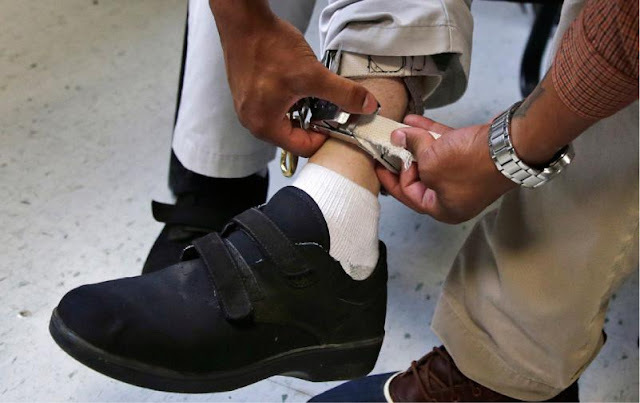 Photo [top]: Judge Rotenberg Center employee Joe Andrade adjusting the strap with shock electrodes on Andrew Goldberg's ankle. (Andrew Goldberg was named as a resident with developmental disabilities in the Concord Monitor.) Photo by Charles Krupa, 2014. Photo [bottom]: A Judge Rotenberg Center employee supervising a young student, who looks afraid, at a computer station. The employee's belt has at least four GED remote control activators hanging from it, each with a student's picture. Photo by Larry Sultan, 2007. In 1986, the Massachusetts Office of Children and Families tried to yank BRI's license to operate while issuing emergency orders essentially telling BRI to get its act together. In response, BRI sued the state government, accusing it of acting in bad faith and abusing its power to regulate by targeting just this one institution, and thereby violating the "rights" of students and parents for them to receive "treatment" at the BRI. The case settled with a consent decree in 1987, which means that the court where the lawsuit was filed (Bristol County Probate and Family Court, as mentioned above) still has control of the case (as opposed to it being considered totally closed at the base court level). The consent decree was supposed to last for one year. It allowed BRI to keep operating as usual, but with one change -- if BRI wanted to subject anyone to invasive aversive treatments, it had to go to court and ask a judge to allow them to add the aversive treatments to the person's individual treatment plan. These special hearings are called "substituted judgment" proceedings, where the judge makes a decision about treatment based on what they think a disabled person would decide if they were "competent." (It's an incredibly ableist legal construct, but that's a topic for a whole other post.) In theory, those substituted judgment proceedings are supposed to be adversarial, meaning that the outcome could go either way -- maybe shock is added to the treatment plan, maybe not. In reality, since the institution of the consent decree, the judges in Bristol County Probate and Family Court have basically rubber stamped every BRI/JRC request to add electric shock to someone's treatment plan. The consent decree was indefinitely extended, instead of ending in one year, and is still in force. In the mid-1990's, the Department of Mental Retardation (now Department of Developmental Services) denied JRC's request for certification to use certain aversives, including the electric shock. So JRC went to court, and DMR was held in contempt. The commissioner was forced to resign. DMR was placed into "receivership," with an outside person appointed by the court to take over everything DMR did involving the JRC -- for ten years (1996 - 2006). On 14 February 2013, the Massachusetts Attorney General's office filed a motion to vacate the 1987 consent decree -- if granted, the motion means that everything in the consent decree now becomes null and void, and the Bristol County Probate and Family Court will no longer have control of the case. The court also has the option of allowing the motion in part, but not in whole. Overall, this means that there is decent possibility that JRC could lose the protection it has enjoyed for almost three decades from the courts. So if you live anywhere near Taunton or can get there, consider going to the hearing! It's important to bear witness to these kinds of things to ensure justice and whistle blow when justice has been miscarried. I think it's especially important here to point out ableist or discriminatory proceedings. I'm planning to be there day one and onwards, longer depending on costs. I can't wait to meet my virtual internet friends who also want to #CloseTheJRC. I won't be bringing any Safety Pat the Proud Schizophrenic Clown gear, gags, or props, as this should be all about the victims and survivors of the JRC. if you prefer not to publish my commentary lydia, please explain to me why when we meet in Mass for the hearing. How is this going? Can we have a progress report? Lydia, is there any way we can get an update on this? I'm unable to find any information on this matter's disposition.